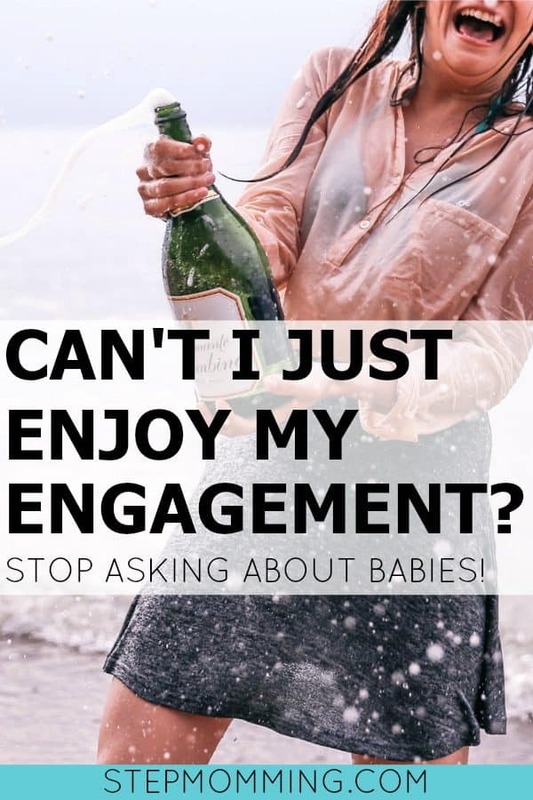 Can't I just enjoy my engagement without everyone asking about babies?! You are here: Home / Family / Pregnancy & Baby / Can’t I just enjoy my engagement without everyone asking when we’re getting pregnant? Can’t I just enjoy my engagement without everyone asking when we’re getting pregnant? Acquaintance: How many days until the wedding? Me: 3 weeks! It’s getting so close! I can’t wait! Acquaintance: How exciting! Then can we expect a little one about 9 months later? No, no you cannot expect a little one about 9 months later. An engagement is an extraordinarily exciting time, and if you do it right, it’ll only happen once. You’re so obnoxiously in love, all you can think and talk about is each other, and you share way too many happy couple photos on Instagram and Facebook. You’re on this crazy high that nothing can bring you down from, and you’re so blissfully happy and in love. It’s a wonderful, beautiful time in our lives, and we want to savor every minute of it. I want to focus on this step before we even think about the next step. I actually looked at my mother-in-law at dinner the night before the wedding and said, “This is my last day with a fiancé!” She thought I was silly, but it’s the perfect representation of how lost in our own little world a bride and groom are right before the wedding. Let’s also keep in mind that I’m stressing over last minute wedding details, and I’m on a serious wedding diet… This is so not the appropriate time to discuss pregnancy. Everyone has told us the first year of marriage is very much the same as engagement: full of life, love, and laughter. We’re going to want a mixture of time alone to enjoy our marriage and time out with others to brag about our happiness. We made a decision that we’d wait 2-3 years after our wedding before we had more children, and I never expected that to bother so many of our loved ones. Shouldn’t we allow ourselves time to enjoy being married before we add a baby to the mix? My husband and I want to travel and see the world. My stepdaughter K is old enough now she can either travel with us, or we can sneak away for a bit while she’s at her mom’s house. A baby would require our attention and presence 24/7. Traveling becomes exponentially more difficult the more children you have, and I’m not ready for that yet. And that’s okay. I’ve only been married 4 months; I don’t need to be ready for a baby (not to mention all that comes with pregnancy). Allow me to enjoy being a newlywed before you wish a baby on me. Please. We are eager to expand our family and to welcome a baby… just not anytime in the near future. We satisfy our baby fever by hanging out with my stepdaughter’s 1 year old sister and our 1-month-old niece and nephew. We offer to babysit and host play dates. But we aren’t ready for our own yet. So, please, stop asking about babies.